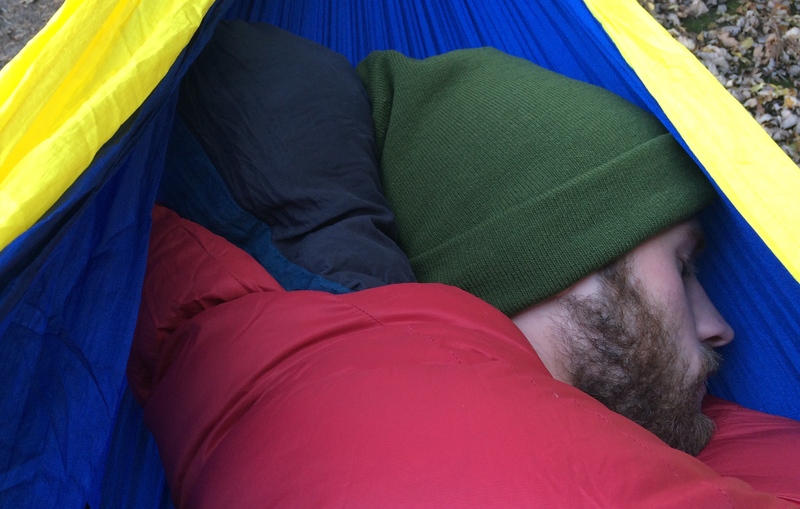 This winter, don’t throw your hammock in a box and forget about it until the grass turns green. 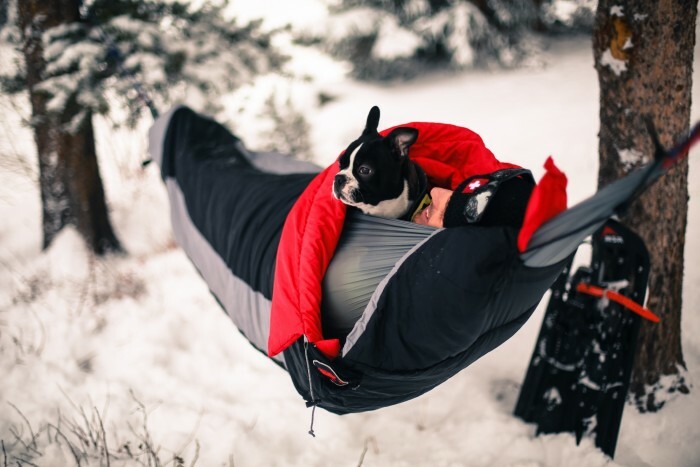 Instead, keep it handy and learn to brave the elements of cold-weather hammock camping. Editor’s note: This article is brought to you by Grand Trunk. Hammock camping is a burgeoning trend in the outdoor industry. Instead of finagling around with a tent and its footprint, rain fly, poles and stakes, many people simply string a hammock up and enjoy a night between trees. However, when winter approaches and the temperature dips under 45 degrees, suddenly the tent replaces the hammock for overnighters. That once-refreshing breeze is now a face-chapping enemy and your once-toasty buns are now cold and numb. With a few tips and tricks, though, you can extend your hammock-camping season into much colder weather. 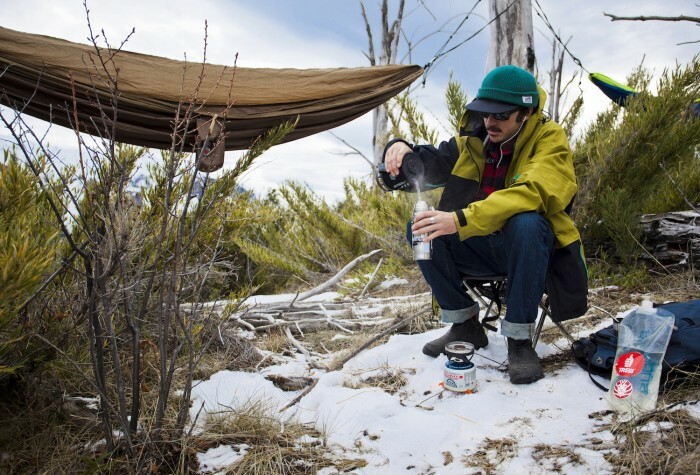 We partnered with hammock brand Grand Trunk for a few tips on how to stay warm when the mercury heads south. 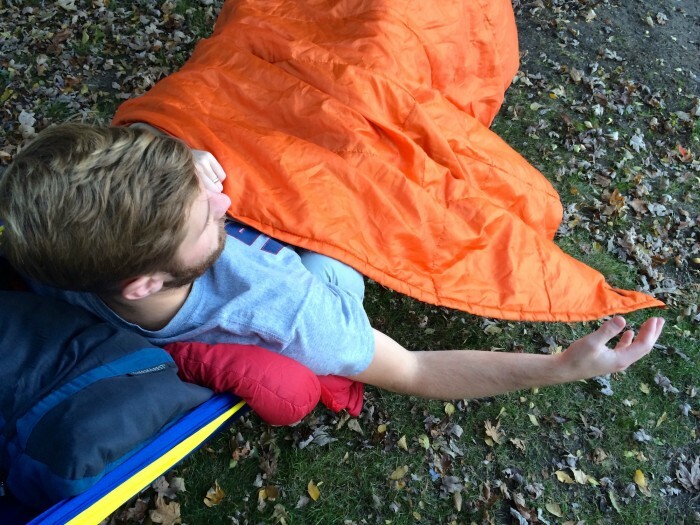 Wind is your enemy when winter hammocking. Find a spot within a dense forest, behind a boulder, or anywhere near a natural windbreaker to hang your hammock. Blankets won’t cut it when the temps dip to 40º, so be sure to bring along a warm, mummy-style sleeping bag. Preferably the bag will be rated to 15º F or less, with a down or synthetic fill. Be sure to cinch the hood closed around your head to shield it from the elements. Bonus tip: keep clothes and boot liners in your sleeping bag to keep them warm and take up dead air space. You’ll be thankful in the morning, too, when you’re not putting on freezing cold, snow-laden clothes or liners. If you’re at all interested in 4-season camping or hammocking, invest in a sleeping bag liner. They’re lightweight and add warmth to your sleeping bag. Other uses include: Eliminating cold spots by shoving it near your hips, shoulders, and feet and doubling as a pillow in a pinch. Though your head will be wrapped snugly in your mummy hood, we suggest that you bring along a pillow as an extra layer between your head and the cold nylon. Not only will you likely be comfier, leading to better sleep, but you’ll also increase overall body warmth by insulating that noggin. It’s essential to trap heat around your body when winter hammocking. A hammock-specific tarp, like the Grand Trunk All-Purpose Rain Fly, is likely your best bet, as you can string it close to your hammock with ease. Otherwise, any standard tarp will do the trick, keeping in warmth and staving off the wind/snow. When laying in a sleeping bag in a hammock, the weight of your body compresses the insulation and minimizes its ability to keep your backside warm. An extra layer underneath you is critical. Enter your sleeping pad. Keep those buns warm by partially inflating your pad and lying on top of it inside your hammock. Don’t have a sleeping pad? Check out the next number. You won’t want your car’s window shade in the winter. 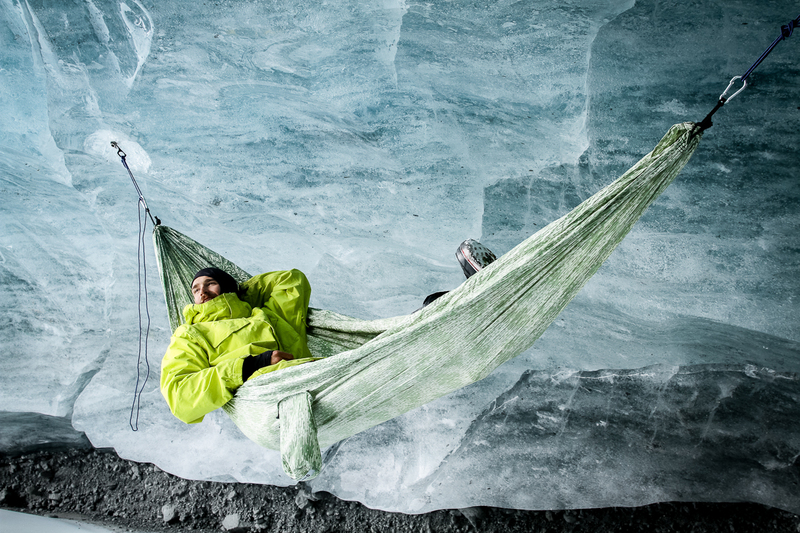 So, if it’s reflective (like an emergency blanket), throw that in your hammock for insulation. Though the constant crinkle noise may keep you up, the extra layer between your sleeping bag and the hammock will work wonders. Also, any closed-cell foam pad will work as a thin barrier to the elements. Consider criss-crossing the shades or pads underneath your shoulders to increase the width in the vital areas. 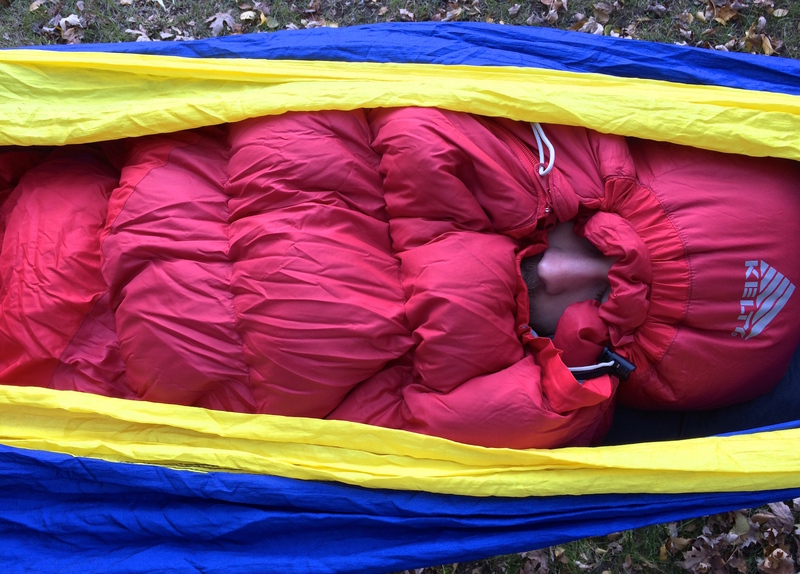 A sleeping bag pod is essentially a sleeping bag that surrounds your hammock. Check out Grand Trunk’s set up below. For uber warmth, you can double up on sleeping bags. You’d be in a sleeping bag, in the hammock, surrounded by the pod. It’s like an inception of sleeping bags. In a pinch, emergency blankets, which are waterproof and windproof, double as an effective underquilt. Underquilts surround the outside of the hammock, protecting you from winter’s nastiness. Just tie the corners long ways to the ends of the hammock and make sure the blanket is snug against the bottom and sides of your hammock. Don’t want to have to deal with tying blankets to your hammock in the freezing cold? Hammock companies make underquilts that are easy to use and much more reliable than a hastily strung blanket. 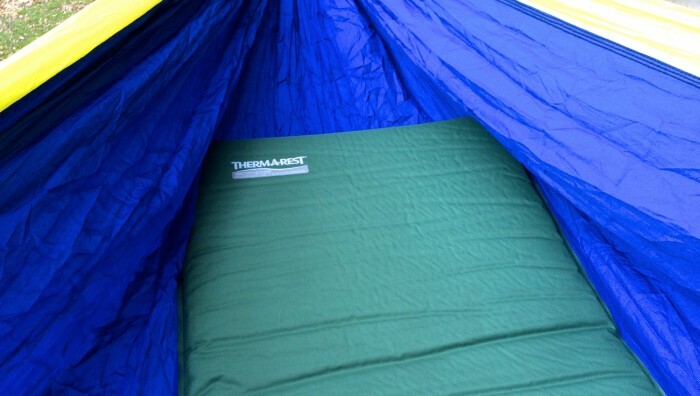 And, unlike a sleeping bag, the insulation doesn’t get compressed underneath you—leaving your cocoon toasty warm. Underquilts are typically paired with a sleeping bag or top quilt. Top quilts are just plain comfy. Since they don’t have a full zipper (or any zipper) like a sleeping bag, they make hammock entry and exit easy. Many companies make them, but you can also make one yourself. Find any cheap, quilt-style sleeping bag, get all set up in your hammock, sling it over you, zip it up to your calves, and let the rest of it lay over you and bunch up on your sides. See? Glorious. Before you head in for the night, boil some water and pour it in a Nalgene or other bottle. Put some socks on and place the hot bottle in the foot of your sleeping bag. The warmth-factor is off the charts, so be sure to avoid burning your skin. Fair weather hammock campers usually opt for the tent at about 32 degrees. If you’re interested in hammock camping when it’s below freezing (some have braved -40 degrees… not recommended), ease into it, do your research, and be prepared with all the right gear. And be ready to turn back if conditions get too downright frigid — it’s not worth a case of hypothermia or worse. So there you have it. The cold doesn’t stand a chance if you’re dedicated enough to combine all of these tips. But when nature calls in the middle of the night, good luck convincing yourself to leave your cozy roost. — This article is brought to you by Grand Trunk.